Fresh as a daisy, the new version of CodyCross is here! In this version, we are welcoming Spring with a special theme. And to further brighten up your spring days, in this version you unlock a brand new world of puzzles with the theme "London"! Happy Spring! Enjoy the journey. Thanks everyone for the feedback and suggestions! Happy New Year! From all of us here at CodyCross we wish you a brilliant 2019! Our resolution for this year is to continue working on creating the best gaming experience possible for all of you, with fresh content and even more puzzles to test knowledge. This first version update of the year, unlocks a new world of Airport-themed puzzles and also comes with some small fixes and technical improvements. Right on time for the holidays! Our tech elves have worked their magic delivering some bug fixes and improvements, guaranteed to make your CodyCross experience a smoother one during this festive season. Happy Holidays from the CodyCross team and thank you for your support. 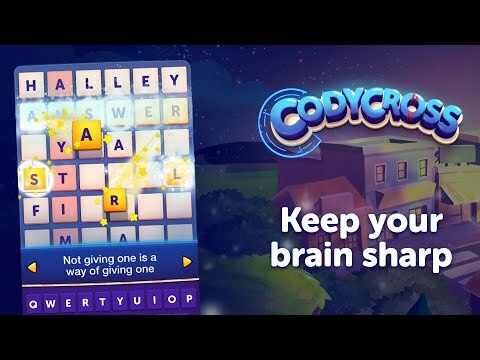 You can now play CodyCross in French! Experience the best crossword puzzles in the universe, now available in one more language. CodyCross has received a magical overhaul in the spirit of the holidays. For those of you that have travelled far enough through the CodyCross Universe, you can now continue your journey to a new world of puzzles with a Wild West theme! Happy Holidays from the CodyCross Team! • One new world (La Bella Roma) with 100 more puzzles for you to enjoy! • One new world (Popcorn Time) with 100 more puzzles for you to enjoy! • One new world (New York, New York!) with 100 more puzzles for you to enjoy! • One new world (Pet Shop) with 100 more puzzles for you to enjoy! • One new world (The 70's) with 100 more puzzles for you to enjoy!